Yet, our latest survey from April 2014 finds that only one in three Americans thinks people in the U.S. are being harmed “right now” by global warming in the United States, a number that has waxed and waned slightly over the past several years. Moreover, just over half of Americans (55%) say they are at least “somewhat worried” about global warming, while only 15% say they are “very worried” about it. Even as the impacts of global warming have increased over time, public worry about it has remained stable, changing little over the past three years and lower today than in November 2008. Perhaps one reason why relatively few Americans are “very” worried about global warming is that few think they will be personally harmed by it. Of those Americans who are “very” worried, about eight in ten (78%) think it will cause harm to them personally. By contrast, of those who are “somewhat” worried, half (51%) think it will harm them personally. Of those who are “not very” worried, only 18% think global warming will harm them personally, and a mere 3% of those “not at all” worried believe it will harm them personally. Likewise, while most Americans (67%) believe future generations of people will be harmed “a great deal” or “a moderate amount” by global warming, only a minority believe they personally (38%), their family (43%), or people in their community (45%) will be harmed. 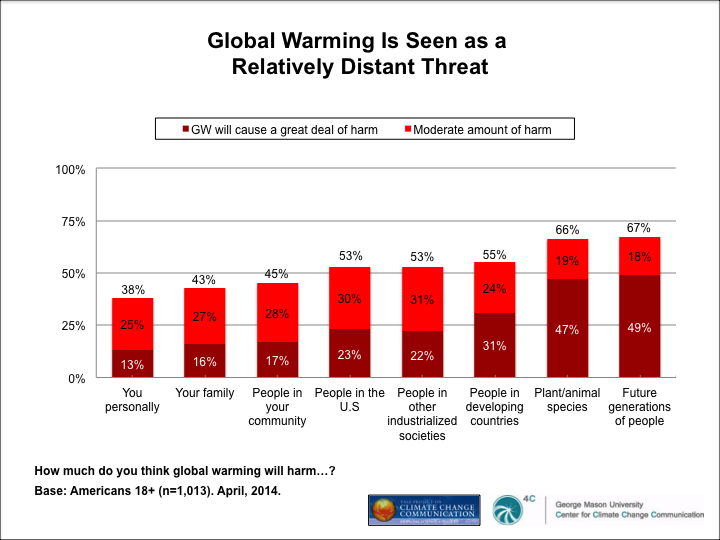 Thus many Americans still perceive global warming as a relatively distant threat. This climate note is based on findings from a nationally representative survey – Climate Change in the American Mind – conducted by the Yale Project on Climate Change Communication and the George Mason University Center for Climate Change Communication. Interview dates: April 11 – 21, 2014. Interviews: 1,013 Adults (18+). Total average margin of error: +/- 3 percentage points at the 95% confidence level. The research was funded by the Energy Foundation, the 11th Hour Project, the Grantham Foundation, and the V.K. Rasmussen Foundation. 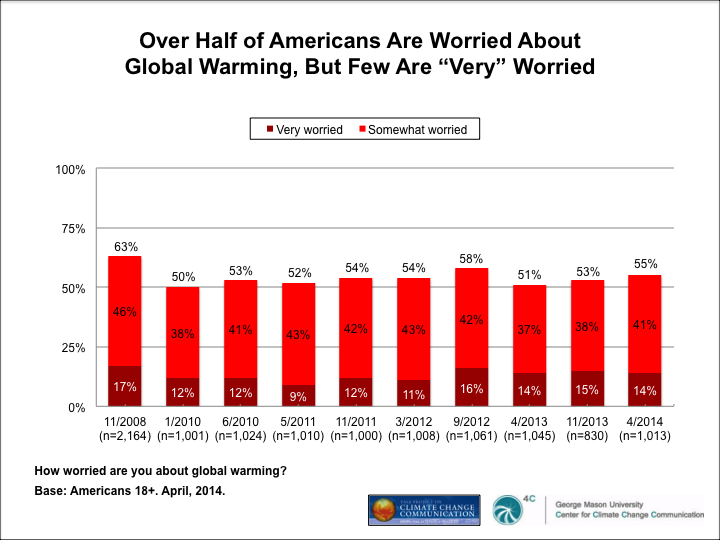 For more findings from our latest poll, go to Climate Change in the American Mind, April 2014.